Dresden suffered terribly in the Second World War, and was thereafter part of that gloomy fortress-state known as East Germany. Yet in the Eighteenth Century it had been, because of the wealth and good taste of its rulers, the Electors of Saxony, an example to all Europe of elegance and good taste. Now much of its beauty has returned. The domes and pinnacles have been restored with loving precision and the cherubs in golden stone beckon once more to those who love the architectural values of Eighteenth Century Baroque. 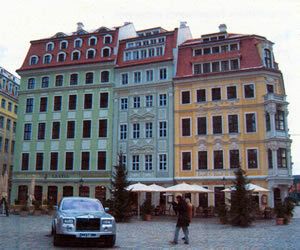 I count myself among their number, and I was therefore eager to see this beautiful city for myself. I was keen, too, to try a hostelry which, in its brief life, has acquired a fine reputation – the Hotel Suitess. As I made my way through the outskirts of the town in the taxi from the airport, I was not impressed by what I saw through the windows. Of course, this would be true for many places, although the drabness of housing estates constructed by Communists always seems particularly severe. But then, with the suddenness of a curtain being drawn back across a proscenium arch, the scene changed, and I was in the centre of the city. Now I was surrounded by extravagance and wonder. And right in the middle, opposite the Lutheran Church of Our Lady (the Frauenkirche), was my destination. The Hotel Suitess is small (it has just 22 rooms) and discreet. Its entrance is at the side of a reconstructed Renaissance building (pictured). The hotel is spread over several of the floors. 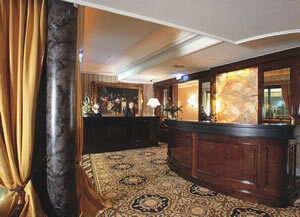 Once inside in the entrance hall (pictured), the feeling is warm and comfortable. The members of staff at the Reception desk were friendly and efficient, as they were throughout my visit, and I was quickly taken up to the fourth floor. 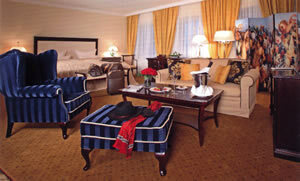 Room 418 is designated a suite and is therefore 560-760 euros a night for two, according to season, breakfast extra. This large room was at the corner of the building and therefore boasted what estate agents like to call a “dual aspect” – that is, its six windows were divided between two walls. Three of these windows overlooked the Frauenkirche itself, which made the drawing of the drapes each morning a particular joy. I liked this apartment for other reasons, too. The colour scheme of yellow and gold, with splashes of dark blue (like the velvet of the wing chair) and brown (like the polished wood of the large pedestal desk) was restful. And there were some unusual features: a column of faux marble, a folding screen with a portrait of Louis XIV and an enormous standing television receiver. In fact, I rearranged the furniture slightly, putting this last item behind the screen. Then, when I found the Classical music station on the set’s radio facility, the Mozart seemed to come straight from the impressive figure of the Sun King. It was a pleasing conceit, and one which caused me some amusement as I relaxed on the two-seater sofa. In the bathroom were two other conceits: a gold-plated rubbish bin and bars of soap in the shape of stars. I had never encountered either previously. This comfortable chamber was a sparkling essay in beige and black, with two wash basins, a tub of the proper size, a separate shower, a set of scales and another television. I enjoyed my bathing here. Dinner at the Suitess is served in the Restaurant Maurice on the fifth floor. 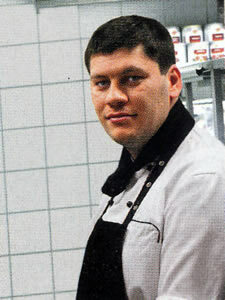 This is a highly regarded dining room, and its chef, André Mühlfriedel (pictured) has a Michelin star. It is a rectangular space with just 24 seats, but the use of spotlights and modern paintings softens the angularity and ensures a sense of welcome. I could have done without the canned music – indeed, I did on several occasions, when I persuaded the kindly attendants (like waiter Christian and waitress Maria) to turn it off for me – but I felt very much at home with the white napery, the silver candlesticks and the good Schott glassware. Mr Mühlfriedel’s cuisine is refined and visually attractive. Dishes are complicated, but clearly focused. There can certainly be no faulting the work rate in this kitchen. Fine ingredients are handled with skill and flair and with an obvious delight in experimentation. And there is intelligence here, evident in the care with which dishes are composed. Occasionally, the experiment can go awry – as when the smoked eel on my plate overwhelmed the saddle of rabbit to which it should have been subservient – but usually success is all around. Two set meals are offered, at 65€ and 93€. I chose from the carte. 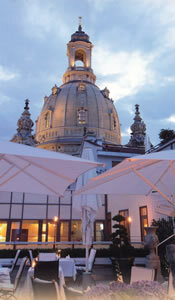 (Allow around 90/100€ for four courses, with cheese at 16€. Those with larger appetites might wish to have the cheese, for the portions are on the smaller side.) Here are the highlights of my meals. As a starter, a piece of pink roast beef, with a salad of crab, cress and cream of avocado, was a triumph of unusual harmonies. A whole red mullet, stuffed with chickpea purée and pecorino, was subtle, stylish and superbly balanced. Lamb with aubergine purée was advertised with spicy cous-cous, but I had substituted carrots and potatoes and found the combination entirely to my liking. (Remarkably, the boiled potatoes were shaped, something I have not seen for about thirty years.) Boiled stilts of calf – my favourite dish of the visit – with artichokes, core dumplings and horseradish foam, managed to be both entirely modern and wonderfully old-fashioned. Of the puddings, by far the best was a chocolate mousse of intense flavour on crisp cake with kumquat and cardamom sabayon. The wine list offers 113 bottles, and whizzes around the world to good effect. Each wine is described (in German). Prices range from 33€ for a chardonnay from the Pfalz (Castell, 2009, which imitates a riesling, with apples and lychees in the mouth) to 980€ for the 1994 Lafite. The following bottles caught my eye: 1998 Grand Puy Lacoste (125€), 1995 Ornellaia (310€) and 2000 Dom Pérignon (255€). From the reliable d’Arenberg winery in Australia, the 2005 Footbolt Shiraz turned out to be a real star, with a glorious depth of ripe black fruit (49€). I returned to the Restaurant Maurice for breakfast. These were good beginnings to each day, for the buffet was extensive (including really delicious grated carrot and beetroot – not my customary comestibles in the morning, but so good they were quite irresistible). Brought to me were pots of coffee and dishes of ice cubes, onion omelettes and lovely bacon, and my concluding cappuccinos. There are so many reasons to visit Dresden: the Baroque splendours of the Frauenkirche, the Hofkirche and the Zwingler Palace; the wonders of the Gemäldegalerie (including paintings by Rafael and Vermeer and an exquisite portrait of Charles I by van Dyck); and the lovely setting by the River Elbe. 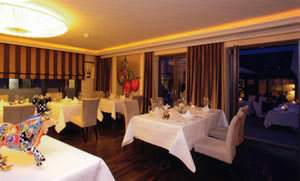 And now there is also the Hotel Suitess: a bastion of comfort and good food in the perfect location. An der Frauenkirche 13, 01067 Dresden, Germany.